Product prices and availability are accurate as of 2019-04-11 22:05:57 EDT and are subject to change. Any price and availability information displayed on http://www.amazon.com/ at the time of purchase will apply to the purchase of this product. Please check the ISBN that your instructor provided. If the ISBN-13 does not match this product (9781305280779) or its Printed Access Card equivalent (9781305280762) this may not be the correct product. In some cases, you may also require a course code from your Instructor. CengageNOWv2 is an easy-to-use online resource that helps you study in less time to get the grade you want. 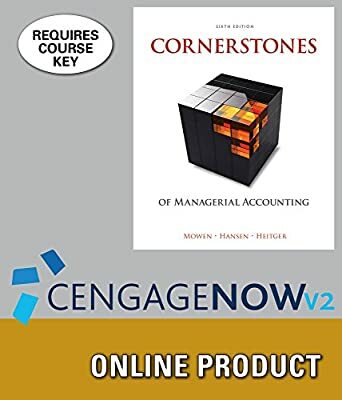 CengageNOWv2 provides you with valuable practice opportunities, immediate and detailed feedback around the clock so that you can assess where you are going wrong, and a host of multimedia study tools to prepare you for the exam. This product requires a Course Key from your Instructor to fully activate. Please consult your Professor or class syllabus for the specific Course Key. ISBN: 9781305280779 This access code entitles you to 1 course enrollment. The duration of the code is course length + 14 days. After this period, this product can be viewed under the "view expired" link in your CengageBrain account.